am: easy 4 miles. A little sore but not bad. This was my first semi-serious race in a long long time. I wanted to do well here and training has been consistent, and slowly but surely progressing. I expected to run well. 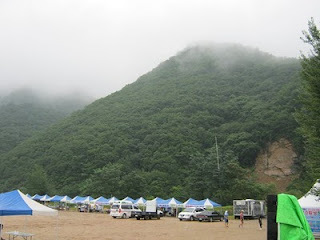 Weather was cloudy, with some off and on light rain, and very humid. The goal was simple- don't go out too fast and try to run even splits-or close. I don't have the exact splits, but I was something like 6:13 at the mile feeling easy. I kept glancing at the GPS keeping an eye on the ave pace, that gradually slowed throughout the last half of the race. At 3 miles I began to notice breathing was becoming labored, forcing me to slow it up just slightly. What did I learn? 6:15 pace is easy, so I probably don't need too much stuff quicker than 6:00 miles in workouts, but I am lacking the strength to maintain it. I need to get my weekly miles up to 50, and I need more long runs (once it cools down here!). Finally, I need more of those 800 interval workouts at a pace that I can handle- either more recovery or slightly slower. What's up next? I've got a short triathlon here in the middle of Sept just for fun, then I'll run another 10K near the end of Sept in Seoul. After that I am already registered for a half marathon Oct 10. Room for improvement, and still time to get there. 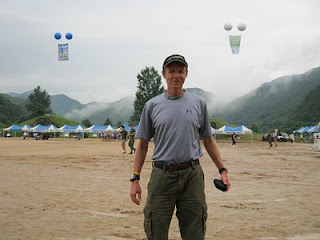 Total run miles slipped this week but back to back 10 milers on Sat & Sun were good. am: 1 mile jog with Sumo, then back down and ran one x 800 in 2:48 against a slight wind. jog for a total of 3 miles. 4 mile easy bike. Heading to Seoul today, then on to the DMZ in the morning for a 10K on my birthday! 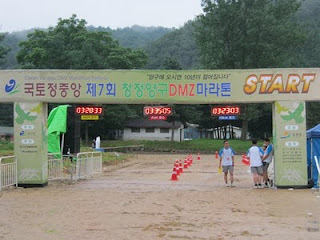 DMZ race I thought about a swim today but during that 800 I could feel my arms getting tight. Better to rest. I just did a short run and one 800 meter hard in these Brooks Mach 9 Spikeless Running Shoe. 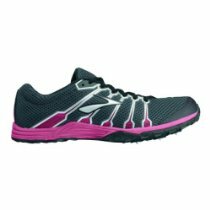 They offer great forefoot support and practically nothing for the heel, making this a pretty good option if you are looking to convert to a forefoot striker. They almost force you to do that. For $30, this is not a bad option for 5K racing. I was surprised at the reviews- and check out what the women have to say about their version- "since they are cute I get to wear them out w/jeans as well. am: 1 mile jog, then back to run 2 quick 800s with 3 min recovery. 2:49, 2:48.
more jogging to total 4 miles. It was nice to finally run something under 5:40 pace. Thinking about doing 4x800 at this pace in the near future, a workout that used to be a staple of mine years ago in Florida. If I recall correctly, I was ready to break 16 minutes when I could do 4x800 under 2:30. 4 mile bike home, then 2 more bike miles to dinner and back. Total: running 4 miles, bike 12 miles, swim 1000 meters. As stride length decreased, the runners bounced less, landed closer to their center of mass, and produced lower braking forces against the ground. A shorter stride allowed the knee to do less work absorbing energy. A 10 percent higher-cadence stride allowed the hips also to do less work. According to Heidersheit, "If they increase their step rate quite subtly–by about 5 to 10 percent, which reduces their stride length by the same–then they can substantially reduce the forces to their knees. That happens primarily because they're lowering the vertical displacement of their center of gravity [their "bounce"], and hence coming down more gently. They also reduce the distance between their foot landing and their center of gravity. This reduces braking forces. The forces absorbed at the hips are also lower with shorter strides. am: easy running with Sumo, then 2-mile time trial in 11:53. No run yesterday, so I was feeling OK and hoping to run 11:40s. 5:55 mile split still felt hard but only a 3 second slowdown is a sign that my strength is coming along. A total 5 miles running, then 4 mile bike to work. pm: 4 mile bike home from work. Note: According to the WAVA Age Graded Caclulator, my time compares to a 25 year old running 9:58. More work to do. am: swim 10 x 50 meters, 5 x 100 meters. No time to run today, just like I thought. Hope to get in something hard tomorrow and take advantage. pm: 6 miles easy. Normally I would have taken off, but Tues is a long work day so rather than 2 days in a row of little or no running I sucked it up and got in 9 min of classic junk miles. mid 150s, meaning I was working hard to maintain a pretty slow pace. Weighed 124.4 lbs post run. Dehydrated! Perhaps the morning workout also had an effect- I biked hard for short periods and the last 3 100s in the pool were all out. This is the first time in ages that I've run back-to-back 10 miles on consecutive days. Saturday was a morning run, and today was in the evening. The extra 8 hours recovery make a big difference. Good series of interviews with Rod Dixon, one of my all time favorites. Dixon had great range- he won a bronze in the 1972 Olympic 1500 meters and the 1983 NY Marathon in 2:08:59. Part II he recalls some great stories about Prefontaine, John Walker, and Part III and IV includes amazing stories about Henry Rono and the 1983 NYC Marathon you have to watch. This is great news- more opportunites for post collegiate runners to continue training at a high level. (competitor.com ) . The list of runners headed to Flagstaff includes Minnesota runner Megan Duwell- I ran with her father and uncle at UW Stevens Point! Up from 37,32, and 3,000 from a week ago. I'd be very happy to reach 50, 50, 5,000. Can't wait for some cooler weather! To stretch or not to stretch? That's a question millions of runners ask themselves daily, but results from a USA Track & Field-sponsored clinical trial involving close to 3,000 runners confirm there is no difference in the risk of injury for those who stretched before running and those who did not. Read more here. According to researchers, if you already stretch before you run, keep doing so, because the number of injuries increased dramatically in runners who made it a habit to stretch and then stopped. Two of the variables recorded were found to strongly influence injury rates; people with a higher body-mass-index were more likely to be injured as were people with a recent or chronic injury prior to participating in the study. am: 1 mile jog with Sumo, then 2 x 2 miles with 5 min recovery. I've never done this workout before but felt like I wanted to do something slower than my 3 min 800 repeats yet faster than a 5 mile tempo. Turned out to be a decent workout- 13:10 for number one, then 12:55 for number 2. I did this on the same loop I did my 2 sub 6 min mile repeats a week ago. pm: swim 5 x 200 meters, then 4 mile bike home on tired legs. The old heel problem has returned. Now what did I different? More long runs, more intervals, and those 2 barefoot workouts didn't help. to be rested before hard intervals, because I like to feel strong. Tough day. The first 3 bike rides I push very hard for short bursts. MY COMMENT: Facinating! Dathan Ritzenhein set the American record for 5,000 meters last year and finished 9th in the Olympic marathon in Beijing. Now he's changing his footstrike? For years running coaches at all levels have not messed with running form, mostly because they didn't know how to go about it. I can't wait to see how this plays out. I like it! Over the course of three large studies, the most recent of which was published last month in The American Journal of Sports Medicine, the researchers found almost no correlation at all between wearing the proper running shoes and avoiding injury. Injury rates were high among all the runners, but they were highest among the soldiers who had received shoes designed specifically for their foot types. If anything, wearing the “right” shoes for their particular foot shape had increased trainees’ chances of being hurt. -Phys Ed: Do Certain Types of Sneakers Prevent Injuries? MY COMMENT: I work for the Army- the reasons for a high rate of injuries in this population is obvious to me. 1. Amazingly, many bases have limited or no opportunities for running on any surface other than asphalt. 2. More active duty are overweight than ever before. 3. It seems to me that a large percentage of active duty simply aren't runners- they run because they are forced to. They have body types that simply aren't able to handle any kind of mileage period, and as a result break down easily. 4. Active duty often take extended leave or other duty assignments- without their running shoes. Weight gain and deconditioning during extended time away from their routine is the norm, not the exception. Then they come back and guess what happens? I could go on and on but the bottom line is this- look for a correlation between body weight and injuries, and I think you'll find one much stronger than anything you'll find related to shoe type. If I had a say, every soldier that cannot meet weight or run standards should be required to take a minimum of 3 spin classes per week. am: 10 miles in 78 min. I ran on base today so I could get in a few water breaks. If it weren't for the heat this would have been much faster. I like this loop from home-plenty of room for improvement. A couple of good quality workouts but no long runs this week. am: 1 mile with Sumo, then 4 miles easy to work to pick up bike, then 4 miles bike home. MY COMMENT: The authors apparently don't think much of the old wet test theory for selecting shoes. Barefoot Running Reduces Energy Cost by 4%! MY COMMENT: This doesn't necessarily mean you can decrease your race time by 4%. However, last month I struggled to run 18:26 on the roads. By comparison, last week my 17:47 barefoot run on artifical grass was easy. That's a 3.6% improvement. Now, if only more races were run on smooth, forgiving surfaces. pm: 3 mile jog, then 2 x 1 mile with 5 minutes recovery 5:56 and 5:58. Clearly I am NOT in sub 18 min shape beacause this was hard! OK what's going on? I've run a few 800 meter interval workouts around 6 min/mile pace and a 18:26 5K last month. Then suddenly I take off my shoes and cruise a relatively easy 4 mile tempo in 26:40 (6:40 pace) on artificial turf. By comparison, I've done a couple of 5 milers around 7 min pace and it was hard! Then Tues I ran barefoot on the grass 17:47 for 5K. Am I really 20 seconds per mile faster running barefoot? I have to go back to the track next week just to verify what's going on- does running barefoot make that much difference or was my normally reliable GPS that far off? am: 2 miles with Sumo, then 4 miles. comfortable. am: 2 miles with Sumo, then 4 easy that felt good. pm: 10 x 100 meter swim, then 4 mile bike. am: Just a short 10 min jog with Sumo and off to work early. pm: Short on time, went to the Zoeckler track for another barefoot tempo run. Weather is warm but there is light rain. 800 warm up and took off- after several minutes of running and seeing the GPS ave pace in the 5:40s, I decided to see if I could hold it for a 5K. Two miles in 11:36 and 3.1 miles in 17:47! If this is real, it's a major breakthrough. 1 mile cool down. Total for the day- 5 miles. I have to watch it though- my heel is a bit sore the following morning. am: lazy, no run but got on the bike rollers for 20 min. pm: waited for it to cool off and biked about 8 miles, then hit the artificial turf at Zoeckler for some barefoot running- started off very slow for the first 800 (well over 4 min), but picked it up to finish 4 miles in 26:40- 6:40 per mile tempo run, and that was basically running goal post to goal post. Believe it or not, that's not a boring workout! I struggled just a little that last mile but I think more from overheating than fatigue. I'm starting to believe that I can hold sub 7 for a long time, but nowhere near 26 miles. Check out the candid post race interview with Chris Solinsky following a 5th place finish in Stockholm where he ran the second fastest 5000 ever by an American - Chris thinks he's go the same speed as the Africans, it's just that with a lap to go they are aerobic and he's anaerobic. He's knocking on the door. Struggling To Lose a Few Extra Pounds? The Answer!